We’re home. | Tweak your week! There’s no secret to the fact that I’ve moved around a lot. This is understood and an accepted part of my life. There are many things that help me cope not only with the moves but with change in general. I keep some things the same. The book shelf in this picture has travelled with me since 2008. A few of the spindles in the jar since 2006. Familiar items placed in similar rooms/windows brings a sense of continuity for me. I Keep colour in the room. 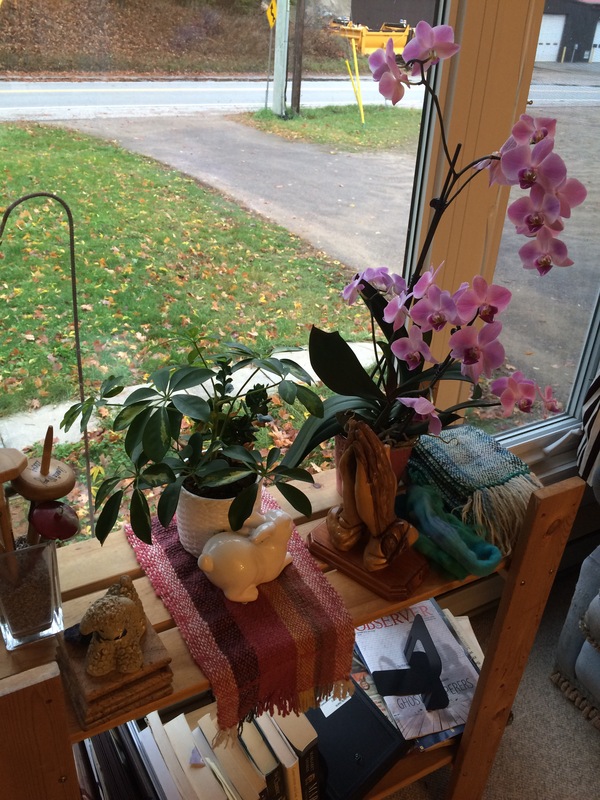 The orchid, a gift in May from Lemonville United, brings a sense of beauty and richness to the feel of the space. Ah, feels like home to me. I Make gentle shifts as I re-work the space. From time to time the furniture will move giving a fresh start. Doing this is great in order to catch the illusive dust bunnies hiding underneath and in corners. Do you move around frequently or have you stayed in one space for decades? Share how you cope if you wish. I’d love to hear your ideas. Beautifully said, Doll, and great ways to feel at home in a new place. I find wherever my books are, I’m at home too! 🙂 The books as well for me (although there are still a couple of boxes to unpack).